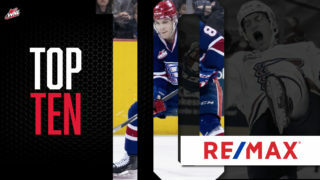 SPOKANE, Wash. – In a press conference at Spokane Arena on Friday afternoon, the Spokane Chiefs officially retired number 14 in honor of former player and long-time NHL standout Ray Whitney. 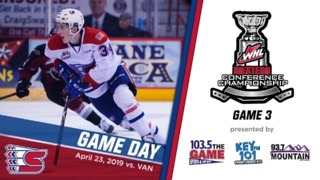 The Chiefs will also have a special pre-game ceremony on Friday night at the Arena before their game versus the Seatle Thunderbirds. It is the first retired number in franchise history. “(Spokane) was a great place to play. The fans were so loud and I want to thank them,” Whitney continued. After singling out many of his former teammates and coaches – including Bryan Maxwell and Gary Braun, who were in attendance on Friday afternoon – Ray addressed the current Chiefs sitting in the press conference audience. Whitney played for the Chiefs from 1988-1991 and was an integral part of the 1991 Memorial Cup Champion team. The forward from Fort Saskatchewan, Alta. played 216 games as a Chief and his name is littered across the Chiefs’ franchise record book: 1st in career points (348), 1st in career assists (207), 4th in career goals (141) and 5th in points per game (1.63). He was nearly unstoppable during the 1990-91 season, posting a franchise record 185 points with 67 goals (2nd-highest single season total in club history) and 118 assists (1st). 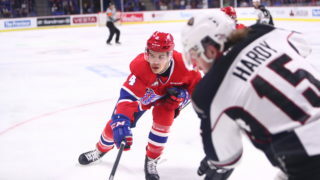 His remarkable season earned him the WHL’s Bob Clarke Trophy as the league’s top scorer and the Four Broncos Memorial Trophy as WHL Player of the Year. He was also named to the Western Conference’s First All-Star Team. He added 16 goals and 22 assists in 21 playoff games, including 13 goals and 18 assists during the exciting 1991 playoff run, earning a nomination to the Memorial Cup All-Star Team as well as the Memorial Cup Most Sportsmanlike Player Award. Whitney, who earned the nickname “The Wizard” for his playmaking ability, was drafted in the second round of the 1991 NHL Entry Draft (23rd overall) by the San Jose Sharks. He went on to an illustrious professional career and became one of just 58 players to ever play 1,300 NHL games (1,330; 53rd all-time). Suiting up for eight different NHL teams, he was a three-time NHL All-Star (2000, 2003 & 2012) and 2006 Stanley Cup Champion with the Carolina Hurricanes. He scored 385 career goals and 679 assists for 1,064 points (64th all-time); one of just 83 NHL players with 1,000 career points. Other notable Chiefs to have worn no. 14 include: Buddy Bodman (WIHL, 1963-71), Ryan Duthie (91-94), Trent Whitfield (94-98), Tim Smith (98-01), Jeff Lynch (01-06), Mitch Wahl (05-10), Adam Helewka (12-15). 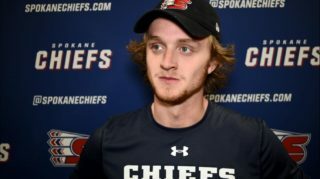 Full video of Friday’s press conference will be available later at spokanechiefs.com. 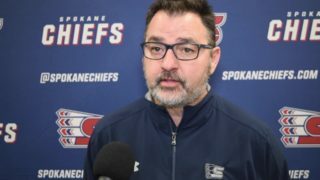 Friday night will be Washington’s Lottery Night at the Spokane Arena as the Chiefs host the Seattle Thunderbirds with the Whitney number retirement set to take place before the game. 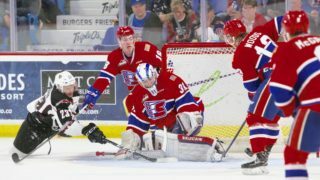 Tickets for all Chiefs’ home games are available via TicketsWest at www.ticketswest.com and via the Chiefs’ Ticket Office over the phone at 509-535-PUCK.